Last week I made gingerbread cookies with a friend and she literally begged me to come up with a recipe for sweet potato brownies. So, here we go! I didn’t only come up with the most delicious recipe, but also shot a tutorial video to make it as easy as possible for anyone to try it out. Let me show you how it’s done! 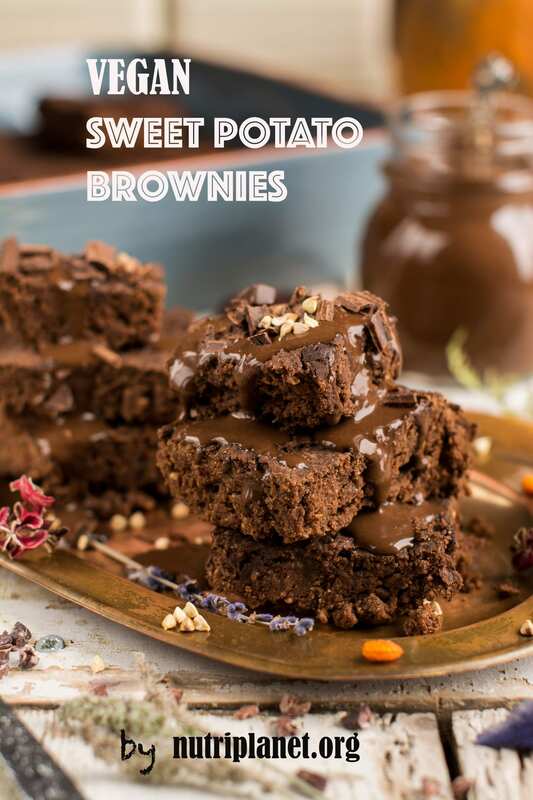 To make my sweet potato brownies you need to have a big bowl, a smaller bowl and immersion or regular blender as well as a small chopping board, knife, spoon and baking tin or pan. That’s it! So moist, thick and gooey! I used buckwheat and gluten-free oat flour as a base for my sweet potato brownies. 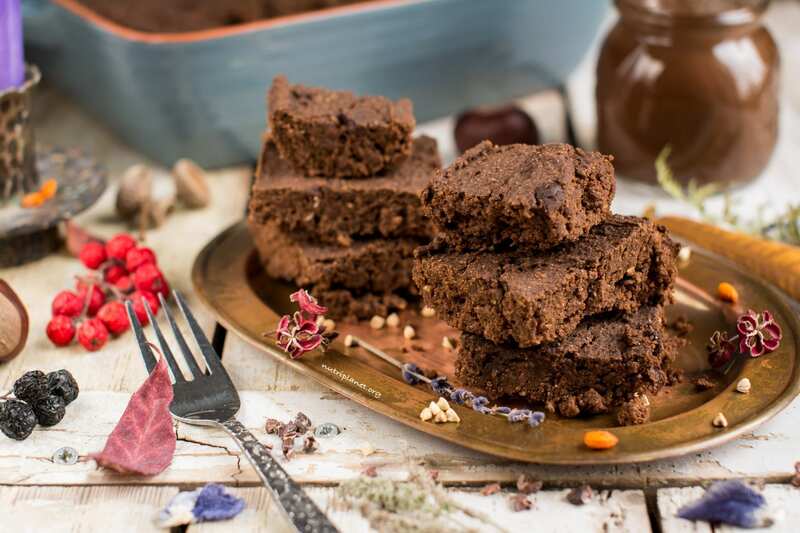 Carob and cocoa powder as well as cocoa paste and chocolate chips are responsible for the chocolaty flavour of my sweet potato brownie. I also decided to add some pureed coconut and peanut butter in addition to cocoa paste to make the brownies a bit heartier. Next come oat milk and the sweet potato itself to give moistness as well as sweet flavour. As I’m on vegan Candida diet I added some xylitol for extra sweetness. Enjoy with or without my healthy chocolate sauce! Perfectly sweet and bitter at the same time. Please let me know, if you try this recipe or have any questions! Leave me a comment below! Peel sweet potato and cut into cubes. Then steam until soft (about 7 minutes). Set aside. Now, chop up cocoa paste and pureed coconut. Place them into a heatproof bowl. In order to melt it, bring water to a simmer in your saucepan. Then, turn off the heat. Next, set the heatproof bowl in the mouth of the pot, making sure the bowl doesn’t touch the bottom of the saucepan. Stir cocoa paste as it softens. Next, in a bigger bowl mix together all the dry ingredients. Using immersion or regular blender process sweet potato, peanut butter, salt, plant milk and xylitol into smooth mixture. Then, pour it onto dry ingredients and mix until you have homogeneous batter. Next, stir the cocoa paste and coconut puree mixture into batter. Finally mix in the chocolate chips as well. Line a round 8” (20 cm) spring form cake tin or 20×20 cm (8”) square baking pan with parchment paper or grease slightly and bake for 20 minutes at 175°C (350°F). Nutritional info (⅛ of brownie): 175 kcal, 27.3g carbohydrates (62.4% of kcal), 6.41g fats (33% of kcal), 4.98g protein (11.4% of kcal), 5.67g fibre, 11.6 GL points. 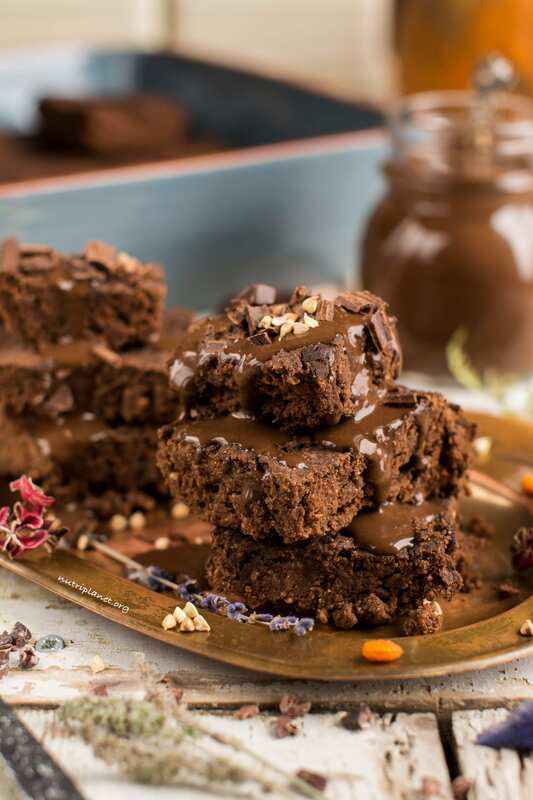 My sweet potato brownie is heavenly with healthy chocolate sauce and/or applesauce. Alternatively, melt the cocoa paste and pureed coconut in microwave oven. Heat it on medium high for about 1 minute to start with. Remove from the microwave and stir. 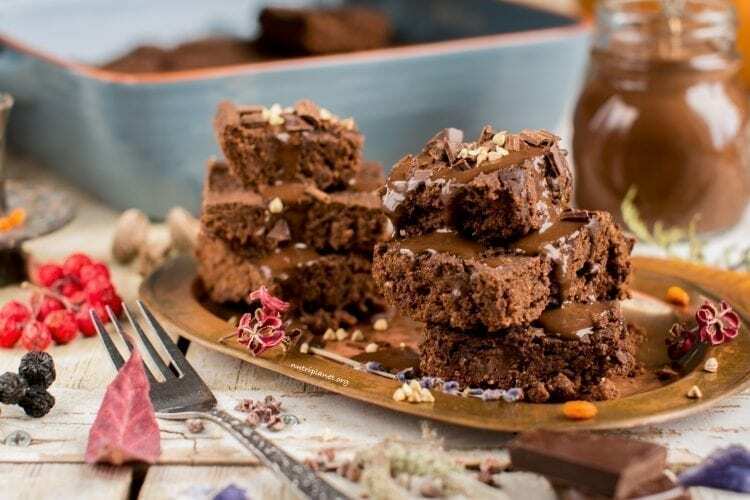 Repeat heating at shorter intervals, 15 to 20 seconds, stirring in between, until the chocolate is completely melted and has a smooth consistency. Grind your own oat flour from rolled oats, if you don’t have oat flour in hand. Use any nut or seed butter you like – almond, hazelnut, cashew, sunflower, tahini. Should you use unsweetened plant milk other than oat or rice, you might need to add more sweetener. Instead of chocolate chips you are welcome to use chopped dark chocolate or cocoa paste. 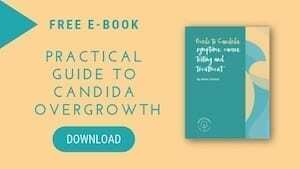 Use any sweetener of choice if you don’t have issues with Candida overgrowth. If you use them up in a few days, store brownies in an airtight container between layers of parchment paper. Before closing it up, place a slice of bread on top. The trick is that the moisture from the bread will keep the brownies. When you notice the bread starting to go stale, replace it. For long-term storage, wrap each brownie individually in plastic and place in freezer.